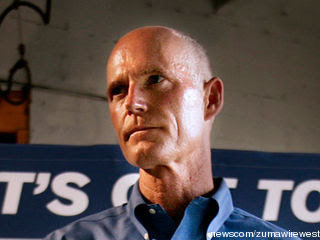 I just read this supportive piece for Rick Scott by Dusty Ricketts for the Northwest Florida Daily News that I thought was interesting - in it Ricketts insists Scott's administration is more business-friendly then the last and that Scott's promise to increase jobs by 700,000 in 7 years is well on its way, but I beg to differ. Gov. Rick Scott pledged to make Florida more business-friendly when he took office in January. According to local economic development officials, he is doing just that. Scott has pledged to bring 700,000 new jobs to Florida in seven years. To help get there, several bills were approved in the recent legislative session to make it easier for businesses to relocate, expand or open in the state. Those include small business and property tax cuts, government restructuring to reduce the amount of time needed to approve or deny economic development initiatives and new incentives for high-wage research and development jobs. All three local economic development agencies are working on projects to bring new businesses to the area. The Walton County Economic Development Alliance has responded to request for proposals from about 12 companies since the beginning of the year, and Phaneuf said it is in serious talks with about half of them now. One of those is a technology company that would create 30 jobs in three years in South Walton. The alliance also talking to prospective tenants for the Northwest Florida Commerce Park in Mossy Head and the Walton County Industrial Park in Freeport. Okaloosa’s EDC has 37 active projects, with about 20 percent of them requiring weekly or even daily meetings. If that 20 percent all comes to the county, that would create nearly 1,900 new high-wage jobs over the next two to three years. TEAM Santa Rosa is currently in serious talks with roughly 15 companies to move to or expand in Santa Rosa County. I'm just curious if Ricketts read his own article. He references Scott's goal of 700,000 in 7 years but can only reference three local development teams that are in "talks" with a few companies, and if those companies were to possibly come to Florida, they would generate just under 2,000 jobs in 3 years. What about the other 698,000 jobs? The article references three counties our of Florida's sixty-seven, so if we look at the numbers - 1,930 jobs in 3 years for 3 counties - that would mean the total number of possible jobs Florida may gain from Rick Scott's administrative efforts would be closer to 40,000 (41,173 to be exact) in three years, and less than 100,000 in seven.